The Graham Office of Career Management at the Gatton College of Business and Economics works closely with the university’s Stuckert Career Center to provide comprehensive career management services to students and employers. The mission of the Graham Office of Career Management is dedicated to assisting students in their career development process and employment success by working closely with employers who seek to hire world ready interns and graduates. There are several parking options when visiting the Gatton College of Business and Economics. The closest and easiest option is the South Limestone Parking Structure #5 located at 409 S. Limestone (there are entrances on S. Limestone and S. Upper Street). Take the elevator in the garage to the pedestrian walkway on level 3. Follow the pedestrian walkway over S. Limestone and continue along the path as it curves gradually to the right along Administration Drive. You will pass the Main and Gillis Buildings. Enter Gatton through the main entrance just off of Administration Drive. See map below. When entering Gatton, the main entrance enters on the 2nd floor. Elevator access - Enter elevators straight ahead. Select level 1R in the elevator. Take an immediate left out of the elevator, then turn right and walk down a long hallway. 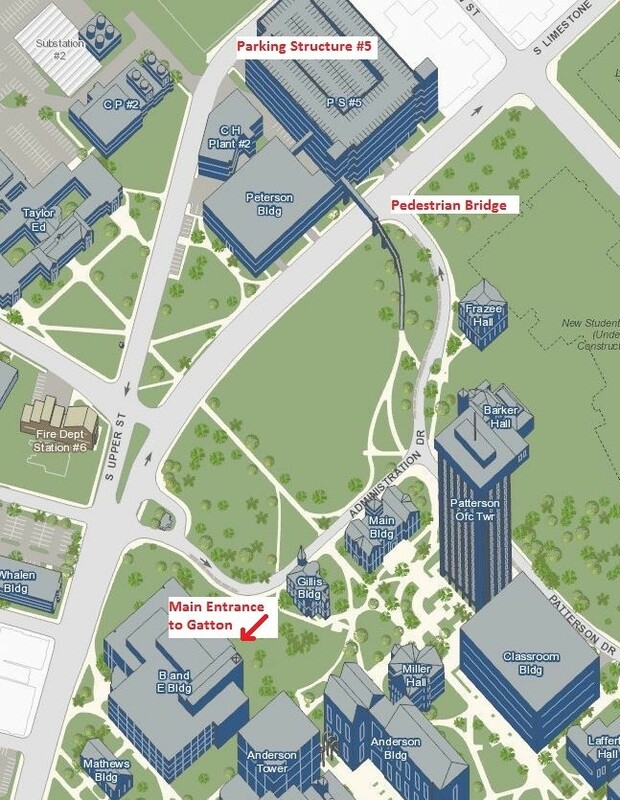 You will pass the Undergraduate Resource Center on the right (144) and classrooms (127, 131) and the restrooms on the left. At the end of the hallway turn left towards the 1st floor entrance and you will see the Graham Office on your left. Stair access - Go through the double doors to the left of the elevator. Follow this hallway around (right and then left) until you come to Stairway C. Follow the stairs down to level 1, travel down the hallway and the Graham Office is located on the left side.